Dover is a city in Strafford County, New Hampshire, United States. The population was 29,987 at the 2010 census, the largest in the New Hampshire Seacoast region. The population was estimated at 31,398 in 2017. It is the county seat of Strafford County, and home to Wentworth-Douglass Hospital, the Woodman Institute Museum, and the Children's Museum of New Hampshire. First recorded in its Latinised form of Portus Dubris, the name derives from the Brythonic word for waters (dwfr in Middle Welsh). The same element is present in the town's French (Douvres) and Modern Welsh (Dofr) forms. On June 28, 1689, Dover suffered a devastating attack by Native Americans. It was revenge for an incident on September 7, 1676, when 400 Native Americans were duped by Major Richard Waldron into performing a "mock battle" near Cochecho Falls. After discharging their weapons, the Native American warriors were captured. Half were sent to Massachusetts for predations committed during King Philip's War, then either hanged or sold into slavery. Local Native Americans deemed innocent were released, but considered the deception a dishonorable breach of hospitality. Thirteen years passed. When colonists thought the episode forgotten, they struck. Fifty-two colonists, a quarter of the population, were either captured or slain. The Cooperative Alliance for Seacoast Transportation (COAST) operates a publicly funded bus network in Dover and surrounding communities in New Hampshire and Maine. C&J Trailways is a private intercity bus carrier connecting Dover with other coastal New Hampshire and Massachusetts cities, including Boston, as well as direct service to New York City. Wildcat Transit, operated by the University of New Hampshire, provides bus service to Durham, which is free for students and $1.50 for the public. Amtrak's Downeaster train service stops at the Dover Transportation Center with service to the Portland Transportation Center, Boston's North Station, and intermediate stops. In the city, the population was spread out with 20.3% under the age of 18, 11.0% from 18 to 24, 30.6% from 25 to 44, 24.9% from 45 to 64, and 13.1% who were 65 years of age or older. The median age was 36.7 years. For every 100 females, there were 96.0 males. For every 100 females age 18 and over, there were 94.0 males. The Dover School District consists of approximately 4000 pupils, attending Horne Street Elementary School, Garrison Elementary School, Woodman Park Elementary School, Dover Middle School and Dover High School. Dover High's athletic teams are known as "The Green Wave," and the middle school's teams are "The Little Green." Saint Mary Academy, a Catholic school, has been in downtown Dover since 1912, currently serving about 200 students from pre-kindergarten to 8th grade. Many students at Saint Mary's subsequently attend St. Thomas Aquinas High School, a Catholic high school located on Dover Point. Portsmouth Christian Academy is located west of the Bellamy River in Dover, serving preschool through 12th grade. The Cocheco Arts and Technology Academy (CATA) is a public charter high school with about 100 students. It was formerly located in Barrington, New Hampshire. The Seacoast Charter School is a publicly funded elementary/middle school that integrates the arts into the core curriculum. The school was founded in 2004 in Kingston, New Hampshire, and relocated to Dover in 2015. Enrollment in January 2016 was 215 students in grades K-8. ^ a b c "Geographic Identifiers: 2010 Demographic Profile Data (G001): Dover city, New Hampshire". U.S. Census Bureau, American Factfinder. Retrieved February 11, 2013. ^ "Annual Estimates of the Resident Population: April 1, 2010 to July 1, 2017: New Hampshire". Retrieved April 24, 2018. ^ Stackpole, Everett Schermerhorn (1916). 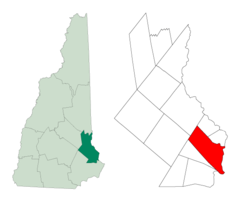 History of New Hampshire. New York: The American Historical Society. ISBN 978-1-115-84294-5. ^ Palmer, Ansell W., ed. Piscataqua Pioneers: Selected Biographies of Early Settlers in Northern New England, pp. 14, 17, 18, 29, 33, 63, 232-3, Piscataqua Pioneers, Portsmouth, NH, 2000. ISBN 0-9676579-0-3. ^ Anderson, R. C. The Great Migration Begins: Immigrants to New England, 1620-1633, pp. 951-7, vol. 2, New England Historical and Genealogical Society, Boston, 1995. ^ Scales, J. History of Dover, New Hampshire, pp. 311-13, facsimile of the 1923 edition, Heritage Books, 1989. ^ "Cocheco Falls Millworks". Cocheco Falls Millworks. Archived from the original on March 30, 2012. Retrieved August 15, 2011. ^ Beaudoin, Cathleen. "A Yarn to Follow: The Dover Cotton Factory 1812—1821". Dover Public Library. Archived from the original on February 23, 2003. Retrieved August 15, 2011. ^ "Take a closer look at COAST". www.coastbus.org. Retrieved 2010-07-06. ^ "C&J: Connecting Dover, Durham, Portsmouth and Newburyport to Boston South Station and Logan Airport". www.ridecj.com. Retrieved 2010-07-06. ^ "Wildcat Transit". Retrieved 2012-04-21. ^ a b "Profile of General Population and Housing Characteristics: 2010 Demographic Profile Data (DP-1): Dover city, New Hampshire". U.S. Census Bureau, American Factfinder. Retrieved February 11, 2013. 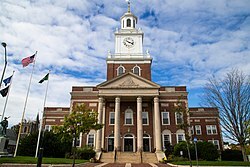 ^ "Selected Economic Characteristics: 2009-2011 American Community Survey 3-Year Estimates (DP03): Dover city, New Hampshire". U.S. Census Bureau, American Factfinder. Retrieved February 11, 2013. ^ "Portsmouth Christian Academy - In the News". www.pcaschool.org. Archived from the original on 2014-08-12. Retrieved 2010-07-06. ^ "The Seacoast Charter School". Retrieved January 13, 2016. Wikimedia Commons has media related to Dover, New Hampshire. Wikivoyage has a travel guide for Dover, New Hampshire. Wikisource has the text of a 1911 Encyclopædia Britannica article about Dover, New Hampshire. This page was last edited on 17 January 2019, at 09:32 (UTC).